Feb. 21, 2015. 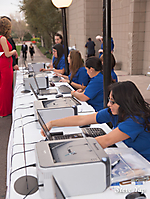 Guests arrived to a red carpet entrance at Arizona Biltmore Resort & Spa and enjoyed a cocktail reception prior to a Fashion Show by Saks Fifth Avenue with featured designers Naeem Khan and Oscar De La Renta. Models from the Agency Arizona walked the runway to music provided by World Life Music. A gourmet dinner, live band, and awards presentation added to this premier charity event. Proceeds raised impacts the lives of thousands of women who come through the doors of the Women's Resource Center each year.